Starting Popular Information was a leap of faith. 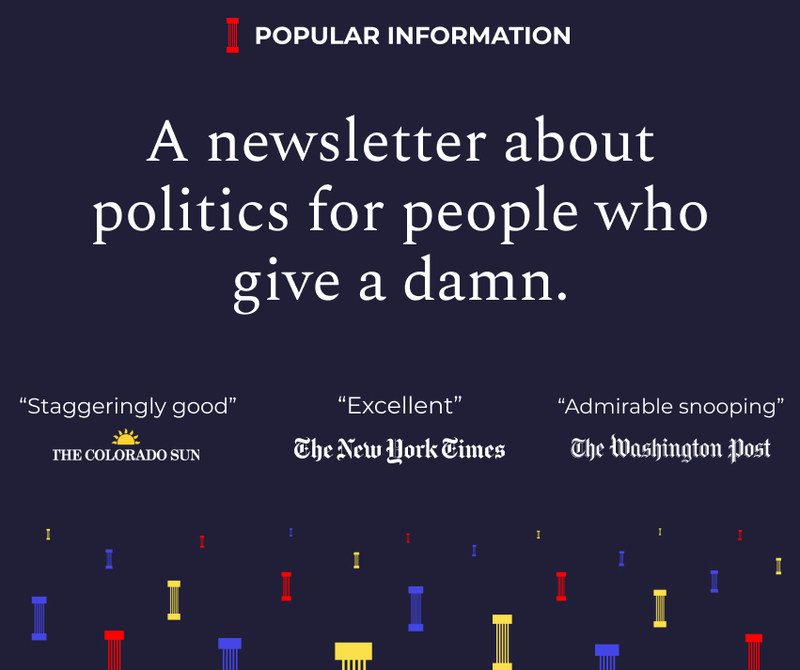 I had no email list -- just the confidence that people needed a source of political information that was unfiltered, unbought and unbossed. Now there are more than 25,000 subscribers. Starting October 1, the next stage of this project will begin. You can stay on the free list, where you'll receive one free newsletter per week. If you want to receive all four editions each week -- and I hope you do -- you'll need a paid subscription. Subscriptions will be $6 per month or $50 for an entire year. The coupons from yesterday are sold out but, by popular demand, I've created another batch. The first 500 people to use this special link, can get an annual subscription for $40 for the first year. I'm committed to making Popular Information available to as many people as possible. If you want to do more, sign up to become a Founding Member. For $150, you'll get an annual subscription, and I'll give away four subscriptions to people who otherwise may not be able to afford it. If you are interested in group subscriptions or have any other questions, just email me at judd@popular.info. To defend himself against two allegations of sexual assault, Supreme Court nominee Brett Kavanaugh is making an outlandish claim. In a letter to the Judiciary Committee, Kavanaugh claimed that his accusers are coordinating with each other. "The coordinated effort to destroy my good name will not drive me out," Kavanaugh wrote. He did not provide any evidence to support his claim. Kavanaugh also described the allegations of Christine Ford and Deborah Ramirez as "smears" that "debase the public discourse." Kavanaugh gave an interview to Fox News — a safe place to give his spin on the allegations. During the interview, Kavanaugh revived the theory that Ford may have been sexually assaulted by someone else who resembles him. I am not questioning that perhaps Dr. Ford was sexually assaulted by someone at some time. What I know is I never sexually assaulted anyone in high school or any time. Kavanaugh's odd claim echoes a Twitter thread posted last week by his friend, Ed Whelan. Relying on information from Zillow and Google Maps, Whelan suggested that it was another classmate, a middle school teacher who Whelan identified by name, and not Kavanaugh who assaulted Ford. Whelan apologized for naming the man but not for advancing the theory. It still seems central to Kavanaugh's defense. "It would have been the talk of the campus"
During his Fox News interview, Kavanaugh also addressed the allegations of Deborah Ramirez, who says Kavanaugh sexually assaulted her when they both were freshmen at Yale. Kavanaugh said the allegation could not be true because "if I did such a thing, it would have been the talk of the campus." But as journalist Jane Mayer, who broke the Ramirez story, pointed out, the incident was the talk of the campus. Kavanaugh's interview reflects a bifurcated response to the two allegations by Republicans. Ford, they claim, is honest but confused. Ramirez, on the other hand, is just making things up. Orrin Hatch, who was also a chief antagonist of Anita Hill, expressed the distinction in comments to the media on Monday. Dolphin signed a letter, along with 65 other former students, attesting to Kavanaugh's respect for women. But at the time, she wasn't aware of the yearbook entry. "I can’t begin to comprehend what goes through the minds of 17-year-old boys who write such things, but the insinuation is horrible, hurtful and simply untrue. I pray their daughters are never treated this way," Dolphin said in a statement. In a statement, Kavanaugh said the reference was to a time he "kissed" Dolphin. Through an attorney, Dolphin said she never kissed Kavanaugh. "The men I knew in college say it is inconceivable that I could have done such a thing," Kavanaugh told Fox News on Monday. But Kavanaugh's roommate during his freshman year at Yale is speaking out. And he believes Ramirez. The roommate, James Roche, said he remembered Kavanaugh "frequently drinking excessively and becoming incoherently drunk." It is from this experience that I concluded that although Brett was normally reserved, he was a notably heavy drinker, even by the standards of the time, and that he became aggressive and belligerent when he was very drunk. I did not observe the specific incident in question, but I do remember Brett frequently drinking excessively and becoming incoherently drunk. Roche was also friends with Ramirez and describes her as "exceptionally honest, with a trusting manner." In tweets, interviews with Sean Hannity and clipped remarks outside the White House, Trump has made it plain that he wants to end the Mueller investigation. It has all taken on increased urgency since two key insiders, Michael Cohen and Paul Manafort, began cooperating with the probe. Standing in his way are Attorney General Jeff Sessions and Deputy Attorney General Rod Rosenstein. Trump blames Sessions for recusing himself from the Russia investigation and Rosenstein for appointing Mueller. Trump has repeatedly and publicly insulted both men, perhaps hoping that they would resign. They have not. Key allies, including Senator Lindsay Graham (R-SC) and White House Counsel Don McGahn, have convinced Trump to hold off firing them. They argue moving on Rosenstein and Session before the midterms election could jeopardize the confirmation of his second nominee to the Supreme Court, Brett Kavanaugh. Graham said that he expected Trump to fire Sessions after the midterms but warned it "would create havoc" -- and jeopardize Kavanaugh's chances -- if he did so before the election. Chuck Grassley (R-IA), the chairman of the Senate Judiciary Committee, said he would make time to consider a replacement for Sessions, but only after Kavanaugh is confirmed. But then Kavanaugh's confirmation went off the rails. That changed Trump's calculus. The story was not true. Rosenstein did go to the White House but attended a senior staff meeting and emerged a couple of hours later with his position intact. Still, Trump is toying with the idea. Following the speculation about Rosenstein, the White House released a statement saying that Trump and Rosenstein would meet in person on Thursday to discuss his future. And thus, the country inches closer to an acute constitutional crisis. Rosenstein is overseeing a criminal investigation into Trump. Trump seems determined to fire him because he won't shut it down. Trump has longed to fire Rosenstein for months, tweeting in April that he was the most compromised person in the entire Russia investigation. He appears to hate Rosenstein more than Mueller. But the recent focus on Rosenstein stems from a report on Friday in the New York Times which claimed that Rosenstein once "suggested secretly recording Trump" and removing him via the 25th Amendment. Rosenstein denied the allegation and other outlets suggested that his comments were made in jest. Trump doesn't need a real reason to fire Rosenstein. His allies have invented dozens of dubious justifications to oust him. (They've even introduced articles of impeachment against Rosenstein.) For Trump, just about anything will suffice. The leadership of Republicans in Congress, including Majority Leader Mitch McConnell (R-KY) and Speaker Paul Ryan (R-WI), claim to support the Mueller investigation. But they argue that legislation protecting Mueller from Trump is unnecessary because Mueller's position is not in danger. "Republicans say Congress doesn't need to pass law protecting Mueller," CNN reported in March. The events of Monday show that this is not true. With the Thursday meeting between Trump and Rosenstein looming, if Republicans were committed to supporting the Mueller investigation, they would pass legislation to protect him from Trump immediately. There is no indication that is going to happen. If Rosenstein is fired, then what? If Rosenstein is fired and Sessions remains Attorney General, who oversees the Mueller investigation? According to the Department of Justice line of succession, the task falls to Solicitor General Noel Francisco. Francisco, a political partisan with an expansive view of executive power, is a marked contrast to Rosenstein, who has thus far resisted pressure to curtail Mueller's investigation. Francisco appears skeptical of the role of independent prosecutors like Mueller. Mother Jones reported that Francisco "in the past...has dismissed the need for special counsels—saying career prosecutors are just as well equipped to look into possible White House wrongdoing—and he has said that executive privilege shields presidents from most investigations." If given authority over the Mueller investigation, Francisco would have the power to end it. But, short of that, he could sharply curtail Mueller's activities -- limiting the scope of the investigation, vetoing criminal charges and preventing the results of the investigation from becoming public. Sekulow's rationale was fuzzy. "I think it clearly becomes necessary and appropriate...that there be a step back taken here, and a review, a review that has to be thorough and complete... and basically a timeout on this inquiry," he said. Sekulow also called for "a second special counsel to investigate the probe undertaken by the first special counsel." Starting October 1, free subscribers will receive one newsletter per week. If you want to receive all four editions each week -- and I hope you do -- you'll need a paid subscription. As a thank you to my early readers, I'm offering a special price of just $40 for the first year. It's available for the first 500 people who use this special link.